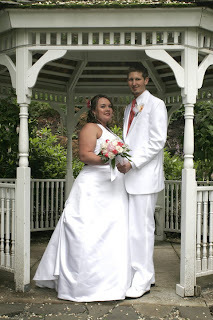 My beautiful sister Maleena got married last weekend to her sweetheart Max. I'd been thinking for a while about what to give them, and finally settled on Family Home Evening helps. We ordered them a subscription to The Ensign (a magazine published by the LDS church), got them a hymn book, and made a bullitin board/Family Home Evening Chart/magazine & hymn book holder. 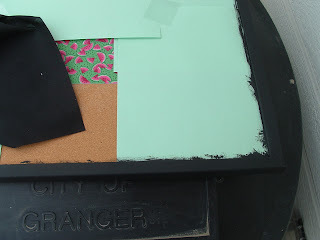 This project is definitely a mixed media tale of using what I had on hand...and at times it would have been easier if I'd been using the right tool for the job...but when you live 10 miles away from the closest place to buy craft/hardware stuff, you make do. I was praying the whole time that my little bottle of mod podge would hold out. All together this project included wood, corkboard, fabric, ribbon, mod podge, paint, glue gun & glue, nuts and bolts, tomato paste can, cardstock, Heat'n Bond Lite, cup hooks...and of course stamped washers. Sorry there aren't more/better pics, but I had a deadline, had my three pairs of helping hands running around, and totally made this up as I went along. I got a used cork board and this funky 70's looking shelf thing from two different thrift stores. I started out just looking for some kind of shelfy thing, but the idea evolved (as it always has to when dealing with thrift store finds). I started by sanding and painting the shelfy thing. All I had was acrylic matte finish paint, so I put two coats of that on and then another coat of mod podge to give it some gloss. 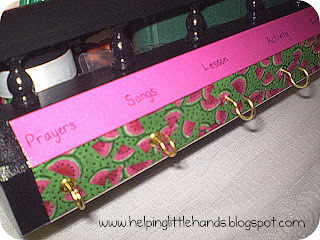 It still needed something, so I used Mod Podge to add a strip of the watermelon fabric (watermelon pink was one of their colors) and some hot pink cardstock. I wrote the labels on the cardstock before the mod podge treatment. And a note of advice...if you go to add little hooks like this, be sure to drill some holes for them first...so you don't break off any of the hooks. I made name tokens out of stamped washers (I know what else), but since they were tucked inside, so they wouldn't get lost at the reception, there's no picture with them. 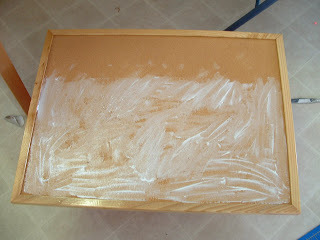 Then I used a very light coat of mod podge to attach the fabric to the corkboard. (The picture makes it look thicker than it was.) I wanted just enough to hold the fabric, but not so much it would soak through and show. My piece af watermelon fabric was not wide enough, so I just used it on the bottom and put black fabric at the top. I used applique techniques for the letters. I made the letters in Word and traced them backward onto some Heat'n Bond Lite. 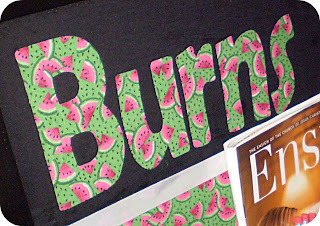 Then cut them out and ironed it onto the backside of the watermelon fabric. 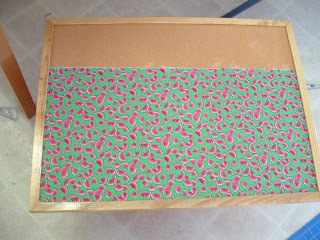 Then I ironed the watermelon fabric to the black. I didn't bother sewing since this shouldn't have to survive washing or anything like that. Once I had the black fabric and letters ready, I lightly mod podged them onto the top of the board. The place where the two fabrics met didn't look quite right, so I added the ribbon with a glue gun. (I also melted the edges of the ribbon just a bit with a candle, so it wouldn't fray.) 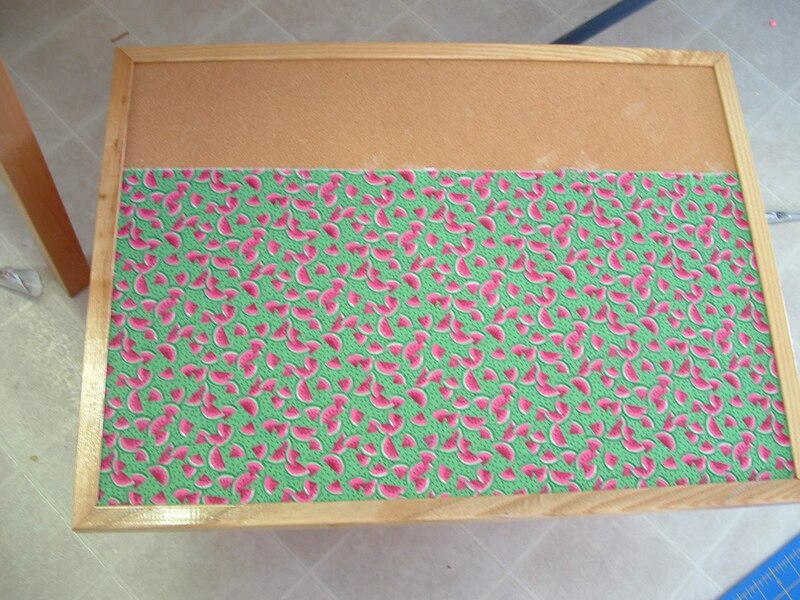 Of course I decided after I'd put the watermelon fabric on that I'd better paint the frame of the corkboard. It would definitely have been easier to do that first, so you don't have to do this to protect your fabric. You can't see it in the pictures, but I also took a tomato paste can (cause I've been hoarding them to make more of these). I painted the top part black and went over it with mod podge for the shine. Then I mod podged fabric to the bottom and put a white ribbon around it (so basically it matched the board.) 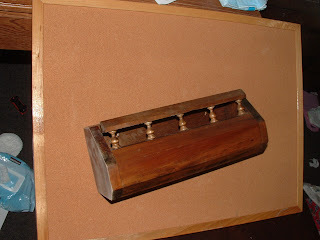 Then I tucked it inside the shelfy thing to hold pencils and such. I also tucked in some coorinating push pins. Sweet Pea had fun with the shelfy thing before it got bolted onto the cork board. Throw it all together and you're done. :) Hope Maleena and Max like it. It was an amazing gift - thanks for putting your time and creativity into such a wonderful way to support their new family! I think it looked great, something to hang where people can see it. Cute! I love the attached caddy! cute! love that it is all together in one spot!!! I love it! What a great idea and a wonderful gift to receive! Thanks for sharing! You did great! Come join the fun and enter my "celebrations" giveaway! Hey polly so I did not know that this was on here till my friend told me.. 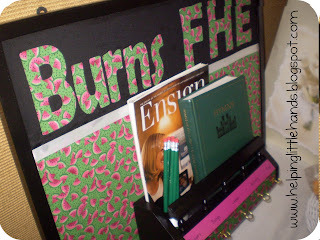 I love my FHE board. I think it will help us through out our life. when we have kids and have fhe with them. thank you so much for all the hard work you put in to it. I love you.